The dog is compact, moderately low set, of medium length with a refined structure but of sufficient substance to suggest the ability to hunt and kill domestic rodents. The parted, straight silky hair presents a well-groomed appearance. It should display Terrier characteristics, embodying keen alertness, activity and soundness. Of moderate length, slightly shorter from the tip of the nose to between the eyes than from the same position to the occiput. 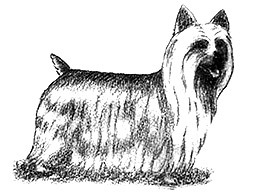 The head must be strong and of Terrier character, being moderately broad between the ears; the skull flat and without fullness between the eyes, with fine silky top-knot, not falling over the eyes, (a long fall of hair on the foreface or cheeks is very objectionable.) Nose black. Shall be small oval never round or prominent, dark as possible in colour with a keen intelligent expression. Should be small, V-shaped with fine leather, set high on the skull, pricked, and entirely free from long hair. Strong jaws, teeth even and not cramped, the upper incisors fitting closely over the lower (scissor bite). Lips tight and clean. Medium length, refined and slightly crested, fitting gracefully into the shoulders. Well covered with long silky hair. Shoulders fine and well laid back, fitting with well angulated upper arms snugly to the ribs. Elbows turned neither in nor out. The forelegs have refined, round bone and are straight and set well under the body with no weakness in the pasterns. Should be moderately long in proportion to the height of the dog. Level topline at all times (both standing and moving), well sprung ribs extending back to strong loins. Chest of moderate depth and breadth. A topline showing a roach or dip is a serious fault. The thighs must be well developed and the stifles should be well turned and the hocks well bent. When viewed from the behind the hocks should be well let down and parallel with each other. Small, well padded, cat-like with closely knit toes, the toenails must be black or very dark. Docked: Set on high and carried erect, but not over-gay. Should be free of feathering. Undocked: The first three vertebrae to be carried erect, the balance to be carried erect or slightly curved, but not over-gay. Must not be curled. The length to give an overall balanced appearance. In accordance with the docked description the undocked tail to be free of feathering. The movement should be free and true without slackness at shoulders or elbows, there should be no turning in nor out of the feet or pasterns. The hindquarters should have strong propelling power with ample flexibility at stifles and hocks. Viewed from behind the movement should be neither too close nor too wide. Must be flat, fine and glossy and of a silky texture. The length of coat must not be so long as to impede the dog's action and should allows daylight to be seen under the dog. The front and rear feet to be free from long hair. All shades of blue and tan are acceptable ,the richer these jcolours and more clearly defined the better. Silver and white not acceptable. Blue on the tail to be very dark. Silver blue or fawn top-knot desirable. Distribution of blue and tan as follows: tan around the base of the ears, muzzle and on the sides of the cheeks; blue from the base of the skull to tip of tail, running down the forelegs to near the knees and down the thighs to the hocks; tan line showing down the stifles and from the knees and hocks to the toes and around the vent. The blue body colour should be free from tan or bronzing. Tan markings must be free from smuttiness. Black colouring is permissible in puppies, blue colour must be established by 18 months of age.